Click the image on the left to see a map of the bike trails. The City of Myrtle Beach website has some bicycle safety brochures. The bikeway facilities in Myrtle Beach are made up of bike lanes and bike trails. There are a number of mountain bike trails in Myrtle Beach. And the Waccamaw Trail Blazers MTB club has good descriptions and maps on their website. The Wacamaw Neck Bikeway is a flat paved path that runs alongside US 17 from Murrells Inlet to Sandy Island Road near Huntington Beach State Park. 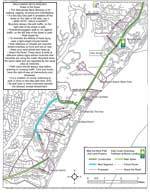 , You can ride or walk from Pawleys Island to Murrells Inlet by using sections of the completed trail and roads with Share the Road signs. There are 6 miles of continuous trail and two sections of approximately 4 miles that is used by cyclists and walkers to exercise and enjoy the outdoors. We recommend you rent a bike and experience the beauty of the trails. Don’t forget to visit Brookgreen Gardens while you are in the area. The following is a video about how the Waccamaw Neck Bikeway got started. Our very own Cyclopedia owner Jack Johnston speaks about how lucky bicycle riders are to have this trail in Pawleys Island. Here is a great overview of the Waccamaw Neck Bikeway from the Official South Carolina Tourism website. Conway is about 15 miles northwest of Myrtle Beach. 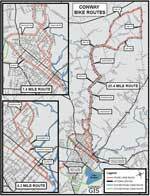 This map shows a 4.3 mile route, a 7.4 mile route and a 25.4 mile route.